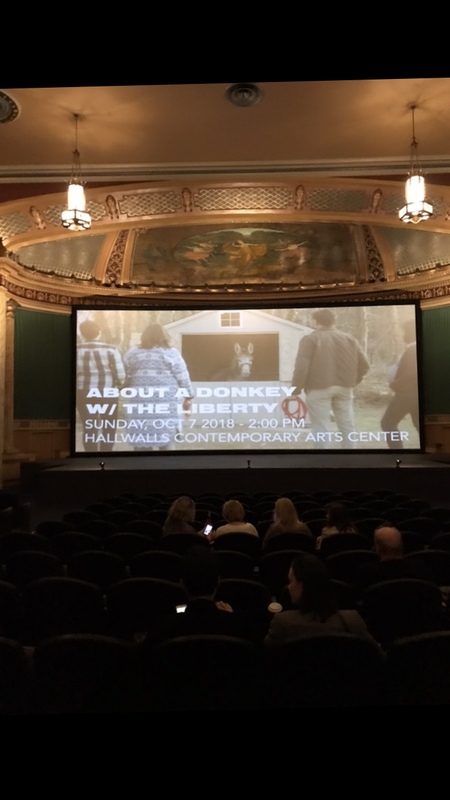 Last Sunday was our Buffalo International Film Festival screening of About a Donkey; and my wonderfully supportive mom Marlene drove Kelsey & me up to spend the weekend experiencing the festival together. We arrived Friday evening and were able to catch 2/3 of an Episodic Comedy block before settling into our hotel. We spent Saturday exploring the area, including the lovely Albright-Knox Art Gallery, and catching as many screenings at the festival as we could. I’ll be honest, I was surprised by the low turnout for all the screenings. Other than a shorts block of many local films, the average screening had 15 people. A high profile invitational at the main theater had 30ish people, which was low but ok; however, two other feature innovationals from Tribeca and SXSW had only 10 or 11 people. One was even the Saturday night feature! And a shorts block of 7 films late Saturday night had just 7 people in attendance. It was seriously surprising. For a festival in its 12th year, and the main festival of a City with not too much going on that weekend (except maybe football), I expected more local turnout. The festival seemed well advertised around town with posters everywhere, but I noticed the festival director was vocal about his disappointment with their local press not fully coming through on their promotion. And I think another issue was venue distances. The bigger name screenings or local screenings got featured in the beautiful North Park Theater, which is where badges were picked up, as was where the step & repeat was with red carpet coverage. I think the average local attendee assumed most, if not all, of the festival took place at that venue - so they just stuck around there. But there was also Hallwells, a nice but small event space across town. It was a 17-minute drive away and definitely not the flashiest of venues. Many of the screenings we attended were there because our NYC-based friends were programmed there (as were we), but I think most non-filmmaker attendees never stepped foot in there unless there was something very specific they wanted to see. Even we wanted to catch more screenings at North Park, but the timing between screenings and the time it took to get between venues rarely made it possible. So, I assume most locals didn’t bother going the extra mile to catch the content at the secondary venue even if they knew about it. Going into the screening (2pm on Sunday), I was feeling a bit disappointed for two reasons. One, the low turnout I’d been seeing overall throughout the last 36 hours we’d been at the fest. And two, the film had been marketed by the festival as a drama. I think the film is definitely a dramedy, but definitely not a straight drama. The festival had changed our synopsis and specifically called it a drama in all their promo despite our labeling it a comedy. I figured that’s how they see it, but it was a bit odd for us because it’s not how we see it. The film is heartwarming & sweet, not particularly edgy, but there’s an intentionally offbeat quality to the film. It has an inherent quirkiness that I think either an audience wants or they don’t. We delve into some serious & sometimes dark subjects, but always in a heightened, humorous way. We try to be clear that it’s not slapstick or Hollywood blockbuster kind of comedy, but it’s definitely intended to be funny with a lot of dry wit meant to make you smile, if not straight up LOL. So, I think, anyone walking in to a screening expecting a drama would be a bit turned off when they find that the dialogue’s kind of constant banter and the plot never gets particularly dramatic. And so, as expected, we ended up with 9 people in attendance (not including the 3 of us). Three of them were filmmaker friends with films in the festival, but the other 6 were locals and presumably non-filmmakers. That aspect was cool; and at the end of the day, I’m grateful when anyone shows up. So that was definitely a treat — to have 6 total strangers take an interest in our movie. 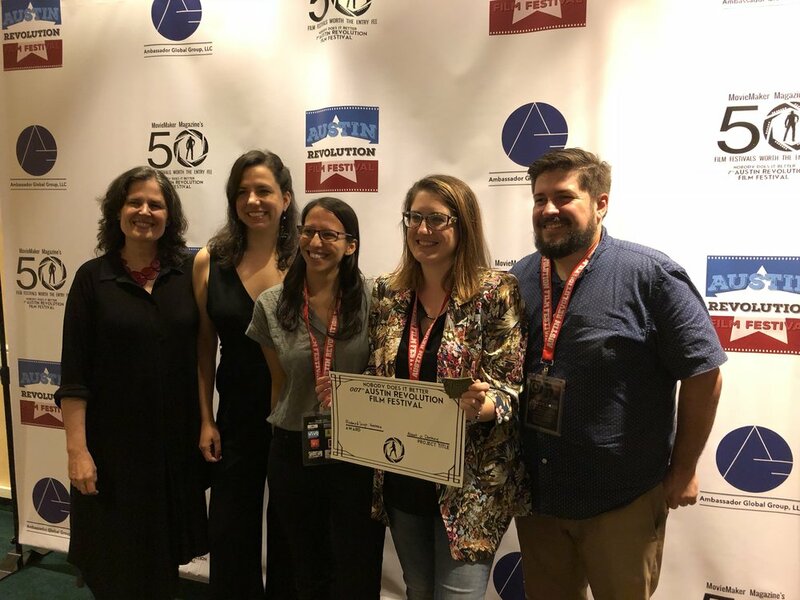 But it was a bit uncomfortable; as Kelsey & I had been spoiled by nonstop laughs at our past 3 screenings and hearing rave programmer reviews in North Carolina or lovely comments from fellow writers about how well we pulled off smart comedy in Austin. This screening had a few chuckles here & there, but otherwise it was crickets. 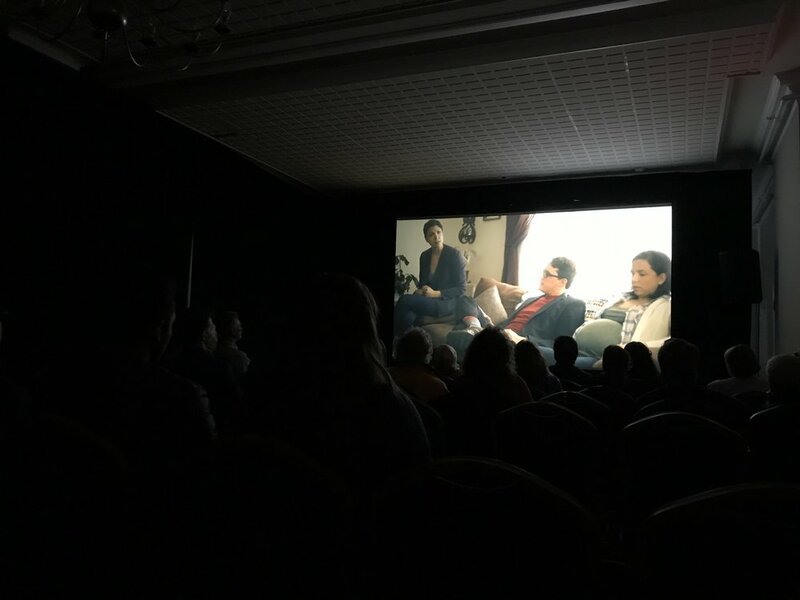 I also think, because this festival chose to downplay the LGBT inclusion of our film (not sure why because they’re definitely queer friendly overall), I think the non-filmmakers in the audience (who were mostly on the older side) were a bit taken aback by the inclusive nature of the film. Overall, I think they didn’t know what they were walking in to in various ways. So, it was interesting to say the least. That said, they all stuck around and were really nice to us afterwards. And one woman, who I believe chose our screening because of our facebook ad targeting, seemed to have really enjoyed the film as a whole and even signed up for our newsletter. So that felt like a triumph alone. Overall, the picture and sound quality of the screening space were solid, and the festival director and staff were all really supportive and truly nice people. But I found the festival venues too spread out to really have a strong community feel amongst filmmakers; and the lack of local turnout was just disappointing. I’d be curious to hear how past years went for filmmakers. Maybe it was just an off year? In any case, I’m grateful to have had the film programmed, especially in a lineup of so many prestigious invitationals. (I appreciate that they do program from their submissions somewhat instead of inviting ALL features like so many other festivals out there (blog post about that coming soon)). At the end of the day, it was really fun spending time with Kelsey & my mom, exploring a new City, and meeting a few other filmmakers at the festival. I’m glad we made the trip. Plus, we got our first official review (that we know of) out of the screening, via The Film Stage. It spoils pretty much the entire plot, so read at your own risk. I’d say it’s overall favorable. Interestingly enough, our B- rating from the writer was actually a compliment because most others he reviewed at the festival got the same or lower, and only one got a B (the highest he gave). So, for such a tough critic, I’m pretty happy with his assessment of the film. And I’m, of course, grateful that he even made the time to watch and engage with it so thoughtfully. I was disappointed that Fry Baby Donuts was closed all weekend. They’re apparently all vegan and amazing. But I tried a piece of vegan biscotti at, horror-themed & meat-free, Grindhaus Cafe. It was good! Adirondack Film Festival, October 19th at 2pm and October 20th at 6pm. Last Tuesday was the September edition of IndieWorks! And it was our annual web series month, where we screen episodes from local series. We screened 5 episodes total and had 35 people in house. Smaller crowd than usual, but considering the pouring rain all day, it was quite an impressive turnout! Web series month always plays a little different because we can’t fully program thematically, the way we would other months. We only showcase web series once per month, so we have to be extra selective based on what we get, while also making it a point to highlight the different styles, genres, and unique stories being told in the local episodic space. So, it ends up being a very eclectic night where the only thing fully tying the lineup together is the fact that the stories are all ongoing rather than standalone. It seems this audience was onboard for the ride and enjoyed the different series highlighted. David hosts an open mic and struggles to survive while raising his son in New York City. After auditioning for a drama high school, 13-year-old Sammy makes a crucial choice that splits the path of her life in two. Flash forward twelve years: in one world, Sammy’s grown into Sam, a confident up-and-coming actress in a turbulent relationship with her girlfriend. In another world, she’s Samantha, an eager assistant director living a life of routine with her longtime boyfriend. Held hostage by her abusive father Albur, sixteen year old Zadie Emerson desperately fights to get free and start a new life. When she awakens a mysterious power within her, however, she must decided between using it to runaway or exacting her revenge. Noah and Julia have never felt like they belonged; aside from with each other. "Queer & Down" is the story of a young queer couple navigating their love for one another, and their sexualities. Noah, a queer transgender man, hopes to find belonging in a world that denounces his unique masculinity. Julia tries to find her place in a world that invalidates feminine queerness. Two unlikely friends with a ten year age gap, Clementine (19) and Allison (29), face problems from the harsh, judgmental world, and find solace in their weird, but loving friendship. ﻿Watch our Q&A Recap. The perk of web series month is that the episodes can be watched online NOW to offer context to the Q&A! Find most on Youtube! At the end of the evening, we announced our winning filmmaker of the Audience Choice Award. We've realized from past years that web series episodes always feel a bit confusing alongside all standalone films at Best of Fest, so we decided moving forward that at this specialty month we'll exclude our Silver Whiskers pick and just award one audience-selected winner all the monetary prizes. The winner receives $50 towards a crowdfunding campaign on SeedandSpark.com should they use the platform and and 50% off 4MileCircus' post-production audio cleaning service for a future project. Join us next month for our Halloween edition on the 30th! 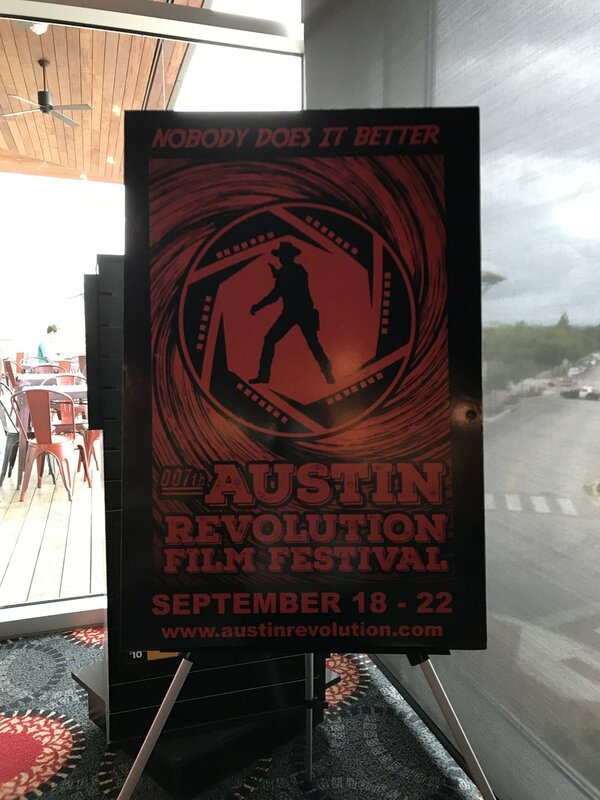 Our About a Donkey screening at Austin Revolution Film Festival was this past weekend, and it was an overall great trip & festival experience. The festival started Tuesday evening, but I didn’t arrive until Thursday afternoon. We decided to make the Austin trip a full (film)family affair, so my husband Justin came along. He spent Thursday evening catching up with friends who recently moved to Austin, while I went to the Filmmaker Mixer, joined by About a Donkey cast member Alexandra Clayton (who also flew in for the festival). We mingled a bit with new faces, but spent most of the hour catching up with each other (Alexandra moved to LA shortly after we wrapped production in 2017), and with a few filmmaker friends I’ve met at festivals in the past. It was a fun night at the Alamo Drafthouse, where we watched that night’s screening of one trailer, a music video, 5 shorts, and a feature — over a 3 hour block. It was a long lineup for one sitting, but mostly compelling enough to warrant the length. That night was, unfortunately, the last screening at Alamo Drafthouse. It’ll admit, it’s a bit disappointing that only 1/3 of the films got a chance to play at their fullest quality in that venue; but I do appreciate the festival trying to squeeze in as many there as possible. 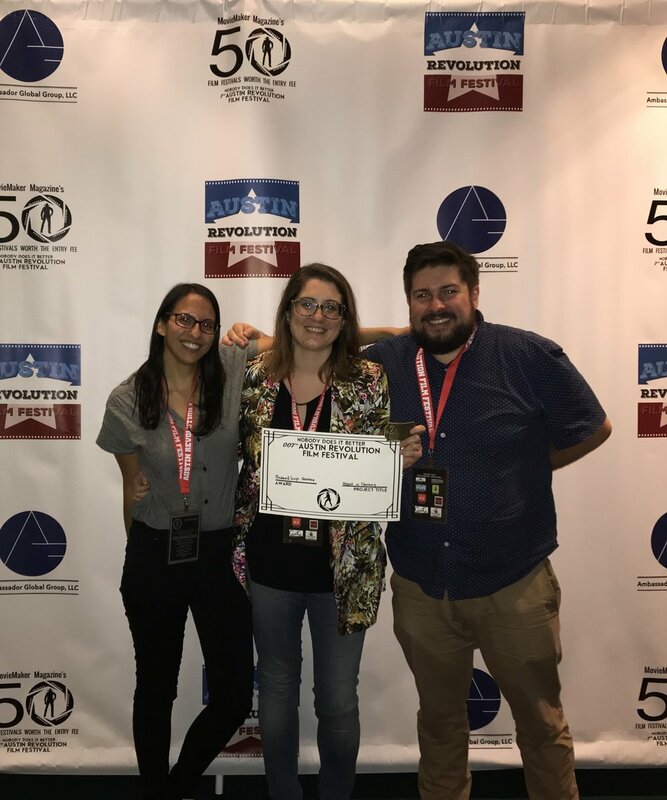 The festival director explained that their weekend conflicted with Fantastic Fest (Alamo Drafthouse’s own resident festival), and as a truly independent festival that doesn’t allow the industry and celebrity to dictate what they program, having all of ARFF hosted at the theater just wasn’t an option. I totally get and respect that. 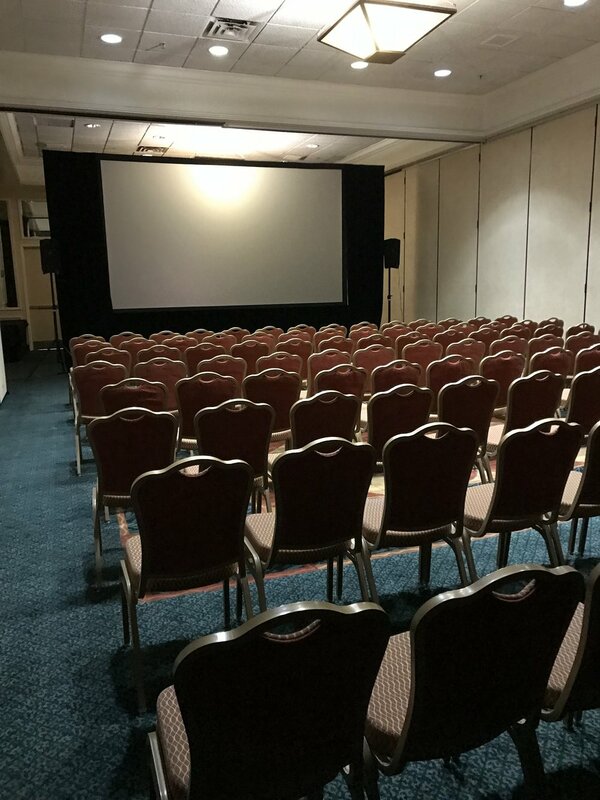 Friday and Saturday moved to the Crowne Plaza hotel, where two rooms where converted into theaters, along with a third space for panels. I’ve been to a few festivals held at hotels and have mostly experienced poor screening quality and non-stop tech issues, so I was a little wary of this one. However, ARFF clearly put in the prep work to make sure the spaces felt as much like theaters as possible. And while the picture and sound didn’t have Alamo Drafthouse crispness, there were no tech disruptions that I encountered throughout the fest. Having arrived late Thursday night, Kelsey & her fiancée (and CongestedCat collaborator) Dani Thomas, joined me & Justin for breakfast Friday morning. Matt and About a Donkey actor Katherine Wessling flew in that morning, and met up with us, as well. (Like I said, full film-family affair.) 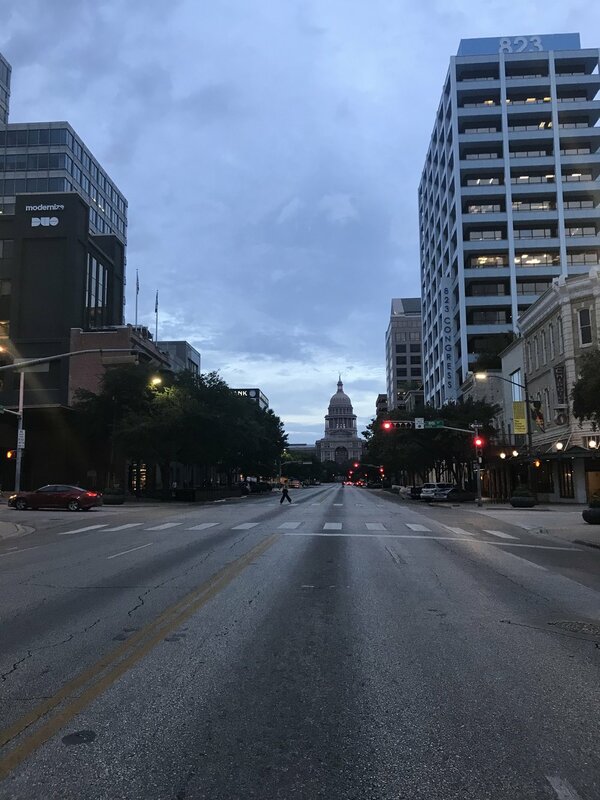 As our first time in Austin, we tried to balance sightseeing, eating all of the things we could, and film watching/supporting as much as possible. We spent the first half of the day walking around South Congress street, taking in the artsy area of the city. Our screening was then at 3:30pm. I’ll admit, this wasn’t a great slot and we were worried we’d have a low turnout. And, unfortunately, that was the case. I do understand that finding a good fit for everyone isn’t possible in a lineup of 150ish films. However, our 5 local friends really wanted to attend but they all had work. If our slot had been just 2 hours later, they could’ve made it. So, though I understand, I’d be lying if I said the slot wasn’t a bummer. I’ll also say that, after our North Carolina Gay & Lesbian Film Festival screening, we were maybe a bit spoiled by how embedded that festival is in the community & how much of a local draw it has. So, our standards of a successful screening for this film had maybe skyrocketed since our Georgia screening. We did some targeted ads on social media for NCGLFF, but our over 100-person audience was really the benefit of that festival’s reach. So, we had high hopes for this festival; not to that degree but we thought it’d have at least a bit of a general public following, as well. That doesn’t seem to be the case, though. 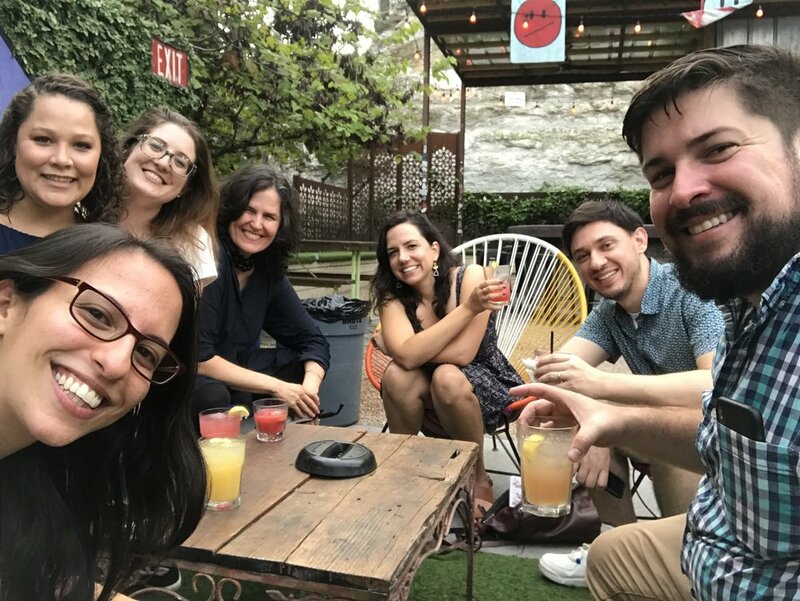 We ended up with just 27 people in the crowd (not including the 7 of us and the 4 filmmakers from the 2 shorts that screened as part of the block). And while I am absolutely so appreciative of the fact that other filmmakers came out to see our film, I was really hoping to get some local, non-filmmaker attendance. Our mission with the film is largely to reach people and generate some conversations; maybe even open minds a bit towards empathy & acceptance. It’s a big part of why we’ve been targeting bible belt areas through our festival submissions. So, to not have anyone in the room that wasn’t a filmmaker with a film screening in the festival was a small letdown. That said, the response from the crowd was truly wonderful. They laughed (someone even told me they cried at a sweet moment), and all had lovely comments during the Q&A and for nearly 30 minutes of chatting afterwards. I’m so honored they chose to see our film, especially since there was another block and a panel happening simultaneously. After that, everyone slept off their food coma, while I caught part of the late night horror-comedy block. As a festival that originally started as a genre festival, horror filmmakers are in high attendance at the fest. So, that was a fun one to attend. Sunday, we had amazing breakfast tacos (at a vegan-friendly place called Taco Joint), and then spent the rest of the day catching films as we could, here & there, before the awards ceremony. We ended up winning Best Produced Screenplay (and Best Animal Actor; go Cinnamon)! Being nominated in 7 categories was an honor in itself, but we have to admit we’re extremely proud & grateful to have taken home that award. 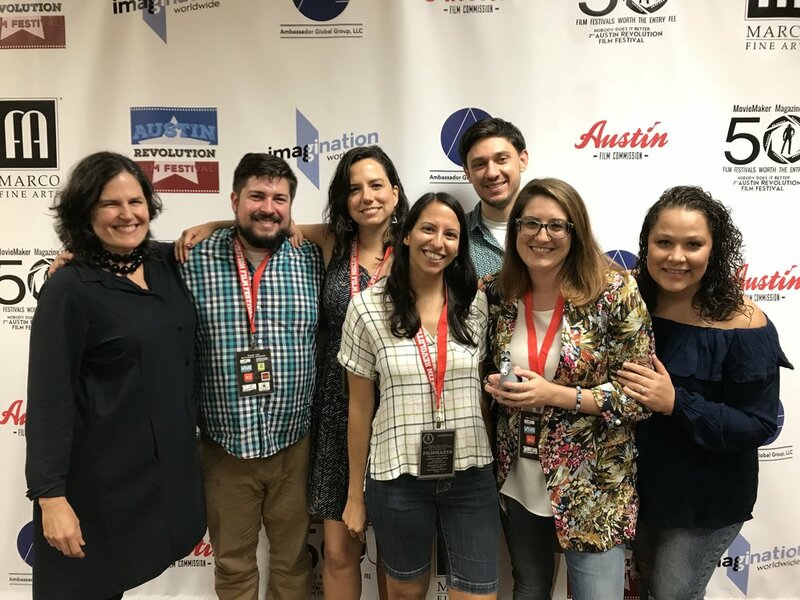 All in all, the experience was lovely because we all got to spend time together in Austin, as well as share our film with an engaged audience. And I got to meetup with filmmaker friends, both old & new — many of whom I’d only known via social media. The festival itself is run by really kind & fun people who, as filmmakers themselves, clearly care about storytellers and why we do what we do. The festival director, Jim, was so enthusiastic about our film. His affection for the film alone made me really excited to attend the festival and meet everyone. There’s a real family vibe. It had the most filmmaker attendance I think I’ve ever seen at a festival of its size, which is pretty amazing. However, as I said, it was really only filmmakers or friends & family of selected filmmakers at the screenings; and not just ours, all of them. I think that, like in New York where there are top industry festivals and so many things to choose to do on any given night, Austin is too booming of a City for a truly independent festival to hook a non-filmmaker audience. They could definitely get there as they grow each year; but I’m sure it’s incredibly hard to get attention & support with Fantastic Fest happening at the same time and the Austin Film Festival right around the corner (not to mention SXSW in March). 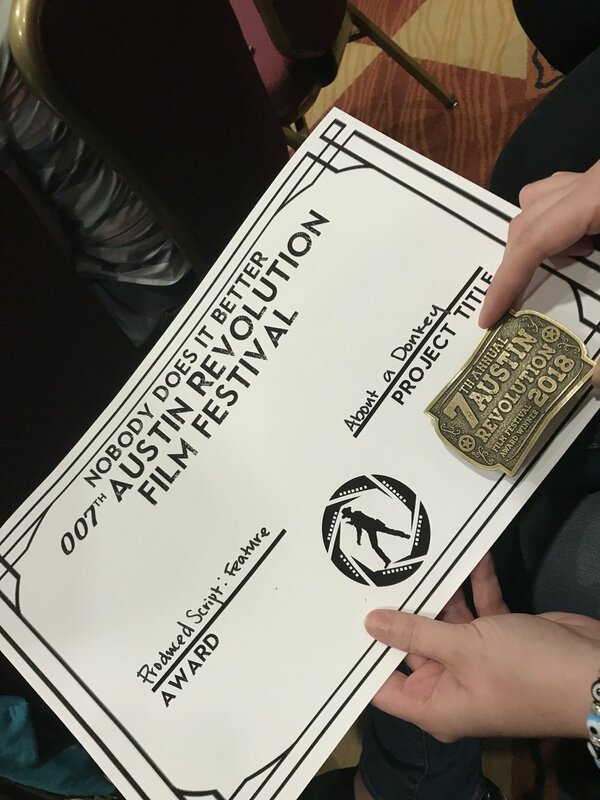 All in all, I would say Austin Revolution is excellent for networking with other filmmakers to find friendship & country-wide collaborators, as well as for seeing truly independent films of wide variety without genre discrimination. It’s not ideal for reaching and engaging non-filmmaker audiences, though. I think that’s totally fine; filmmakers should just know what their goals are out of every festival and what they can expect from attending. So, hopefully sharing my experience offers that insight. Bananarchy, the frozen banana truck (not stand), is AMAZING! They label all vegan options. It’s definitely a must-try if ever in Austin. Buffalo International Film Festival on October 7th at 2pm.